One of those places is http://pinstack.com, where you can pay $7 to get an so-called iBerry theme for your 8300 smartphone that will make its homepage appear like an iphone as shown in the image above. While at the site, you may also want to browse around forums and FAQ section, they provide some really good information there. 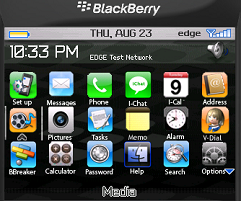 Or you can download the BlackBerry 8830 iphone theme at the next page. If custom themes are not your thing, you may still want to give your BlackBerry curve some personality by downloading and installing some ringtones from various website. Handango.com used to sell a download package of midi and polyphonic BlackBerry ringtones back in 2005. But I couldn’t find it anymore. However, since the BlackBerry Curve supports real mp3 as ringtones. It should be pretty easy for you to make your own mp3 Blackberry 8300 ringtones and install it on your phone.